Notes: The old pali road may be mostly hiking trails at this time. The legends of Pele appear to also be in effect for the new highway as well. Far, far away from the snow kissed mountains of Central PA is the lovely little series of islands called Hawaii. If you travel from downtown Honolulu to the windward side of Oahu , you will take the Pali Highway. Before this more modern road, there was another. It is called the old Pali Road. Sitting here awaiting yet another Snow storm in the Lewistown PA area, we decided to take you to a place where snow never falls. There are many supernatural stories attached to the old Pali road. This road was built on what was one of the most critical battles of the King Kamehameha's unification of the Hawaiian Islands. 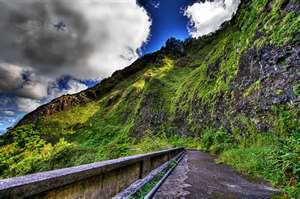 On this road there is a spot, on the Koohau Mountain called Nuuanu Pali. Nuuanu Pali is a cliff that is reputed to be the windiest spots on Oahu. This cliff is also where in 1795 King Kamehameha I, forced many of his opponents to jump from the cliff to their deaths. seeing soldiers leaping off the cliff. Another phenomenon is the “Night Marchers” If you do cross their path it is wise to lie on the ground face down quietly till they pass. Over many parts of the road are reports of dark dwarfs darting across the road. looks normal until people get up close and see the budging eye and missing the lower half of her face, She appears to have caused no harm to any who witness her. There another part of the highway that is called "Morgan's Corner". This is the area where many apparitions are seen. One is particular is Brittani Lochmann, who was a teenage girl that hung herself on the one giant tree that is there. During her suicide her head severed from her body. The head was not reattached prior to burial. The belief is she is not at rest and is searching for her head. People report seeing her hanging on the tree. They also hear mysterious sounds on their car roof tops in the area. There is a legend current to this day that you are not able to travel the road with pork in your car. Yes, pork as in pig. That unfortunately also means BACON. half-man, half-pig sort of dude) used the form of a pig to travel. This ability of the gods to use Kinolau to assume the forms of elements of nature is the root of this issue. So travelers that may be transporting her enemy often have car trouble. However, you can keep your pork sandwich with bacon for the ride if you cover the sandwich with a banana leaf. This supposedly is able to fool Pele, by shielding the pork from her senses. However this may not be a foolproof method as one woman was smuggling pork downs the highway. At one point she saw a woman sitting in her back seat, and suddenly felt as she was being choked from behind. This force was so great that she lost control of her car and almost hit a tree. She was able to toss her sandwich out the window just before she blacked out. As soon as the offending object was out the window, the choking stopped. If you do not get attacked and just break down, you may see a small white dog. This canine visits the car as you are stranded on the side of the road, The dog is said to grow in size until the offending pork is discarded or the passengers urinate on their own car.